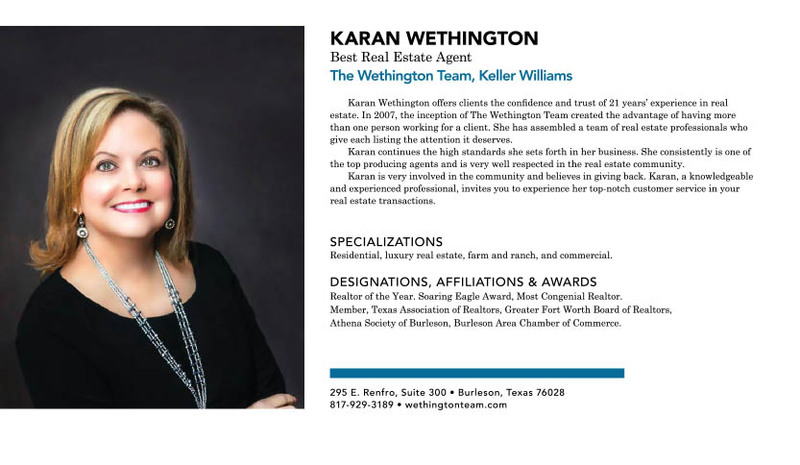 Karan Wethington offers clients the confidence and trust of 21 years’ experience in real estate. In 2007, the inception of The Wethington Team created the advantage of having more than one person working for a client. She has assembled a team of real estate professionals who give each listing the attention it deserves. Karan continues the high standards she sets forth in her business. She consistently is one of the top producing agents and is very well respected in the real estate community. Karan is very involved in the community and believes in giving back. Karan, a knowledgeable and experienced professional, invites you to experience her top-notch customer service in your real estate transactions. Residential, luxury real estate, farm and ranch, and commercial. Realtor of the Year. Soaring Eagle Award, Most Congenial Realtor. Athena Society of Burleson, Burleson Area Chamber of Commerce.